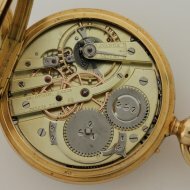 #1665 Louis Audemars, made for Charles Oudin, Palais Royal 52, Paris. 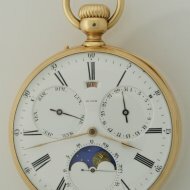 A yellow open-faced full calendar pocket watch with moon-phases. 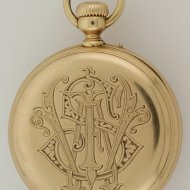 SOLD High quality pocket watch from Louis Audemars made for Charles Oudin.Louis Audemars case serial number 9189 dating the watch 1863-64. 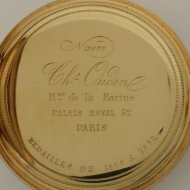 Golden inner lid has Charles Oudin number 19699, Horloger de la Marine, Palais Royal 52, Paris. Medailles de 1806 a 1862. Enamel dial plate has day-, month-, date-- and moon indication. 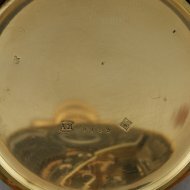 Backlid has WFS monogram.